Imagine my emotions when I saw this. 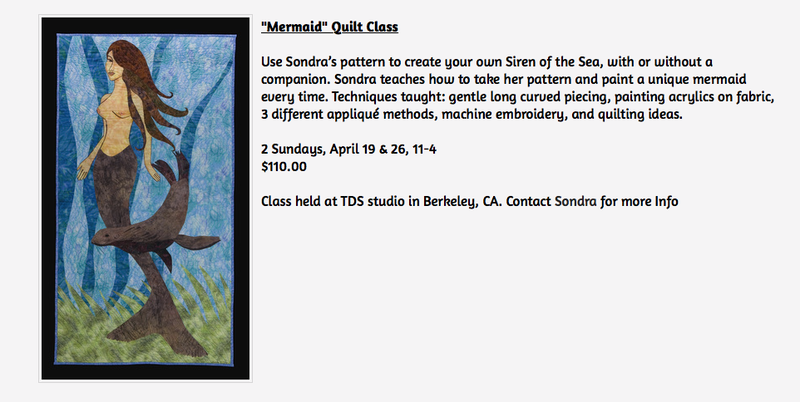 Mermaids of Berkeley! This drawing is of the livery collar of Thomas de Berkeley, 5th Baron Berkeley (d.1417). 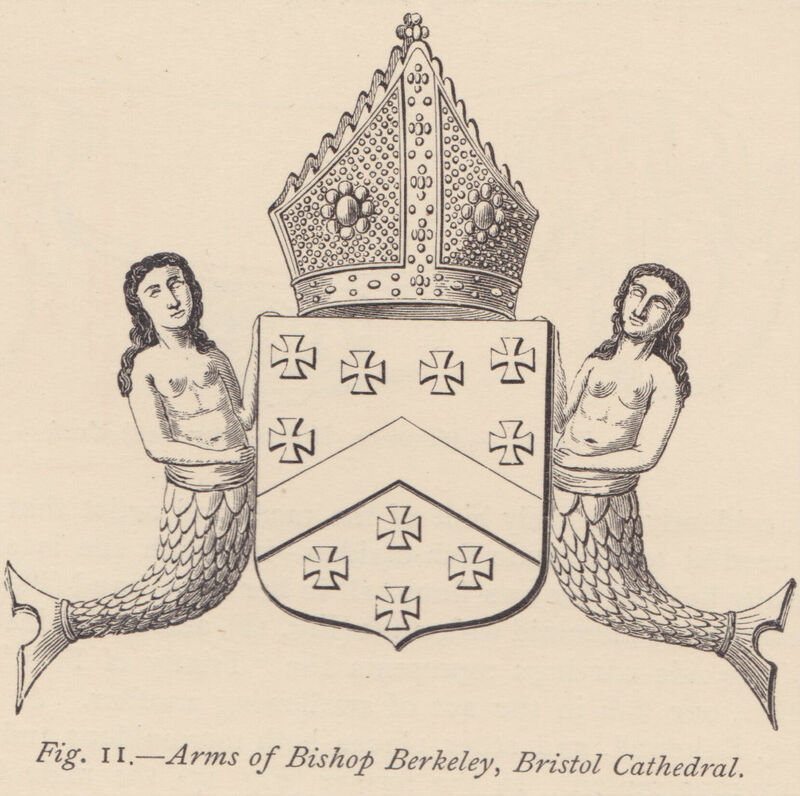 The Berkeley heraldic badge featured the mermaid! 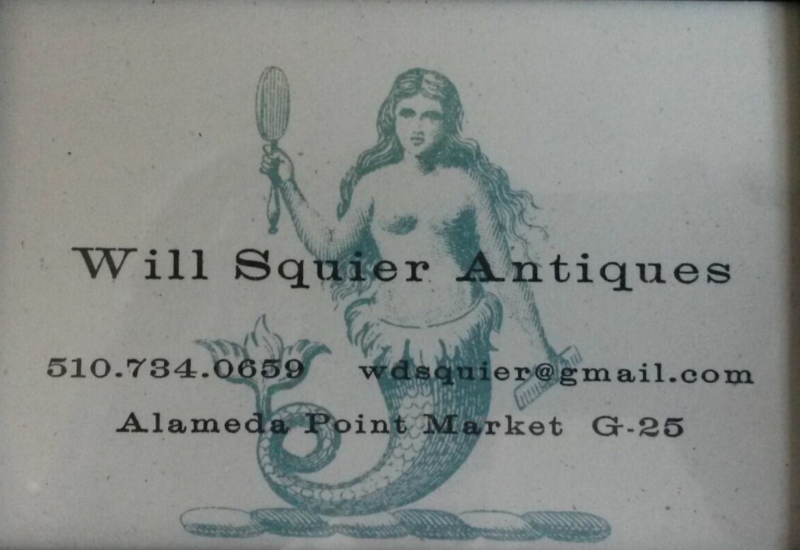 I had embedded a few mermaids in my Of the Sea post, but this a game changer. I had no choice. 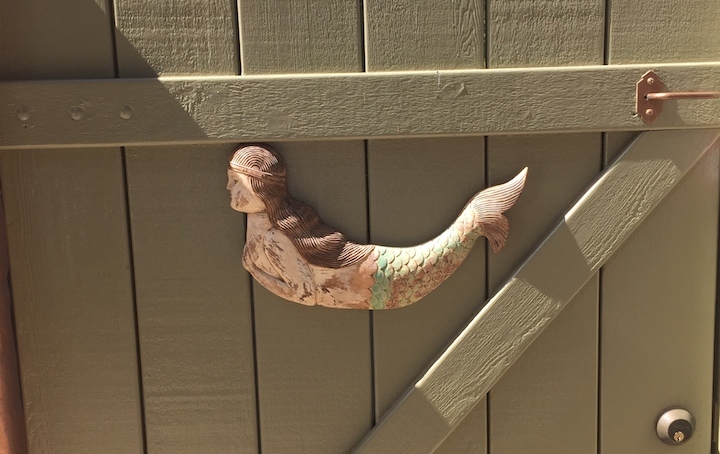 Mermaids must be strengthened and posted on their own no feet. 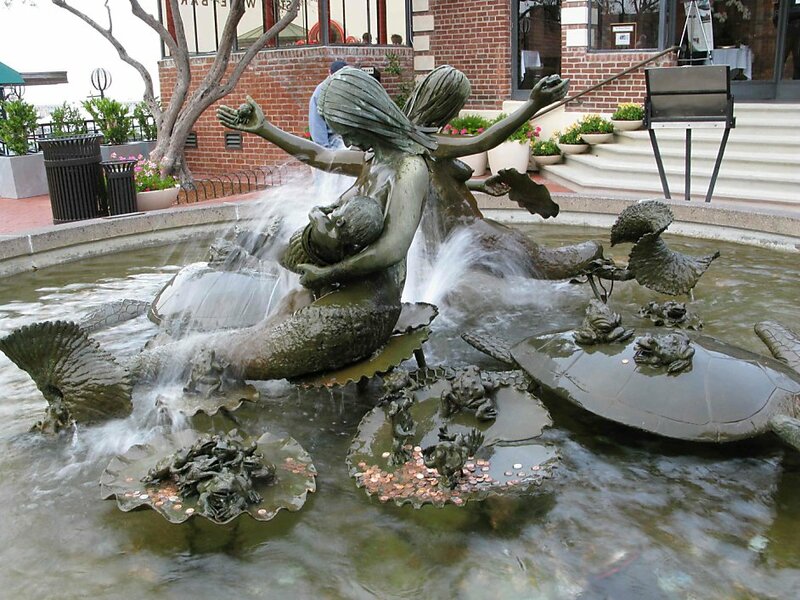 Mermaids have appeared in the folklore of many cultures for many centuries. They have fascinated us for many years. 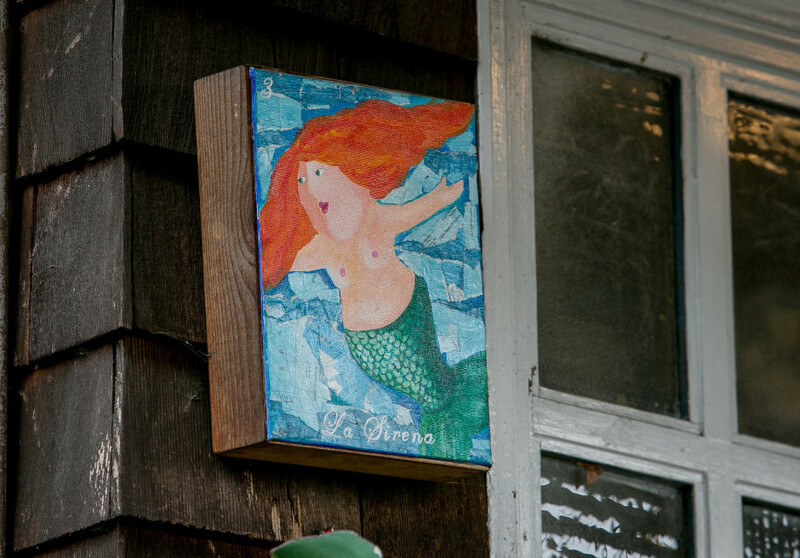 I’ll bet that Gabby has mermaid postcards, not that we need to see them. An early mermaid in folklore was Atagaris, an Assyrian goddess who blew it. 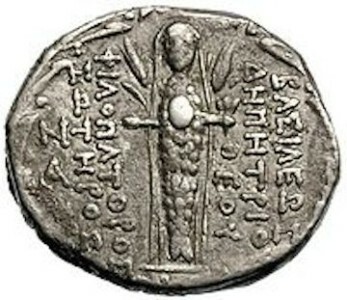 She loved a shepherd, a mere mortal, and then killed him, as the idiom now is, “on accident.” Bereft, she jumped into a lake and tried to pass as a fish but her divine beauty came screaming through. 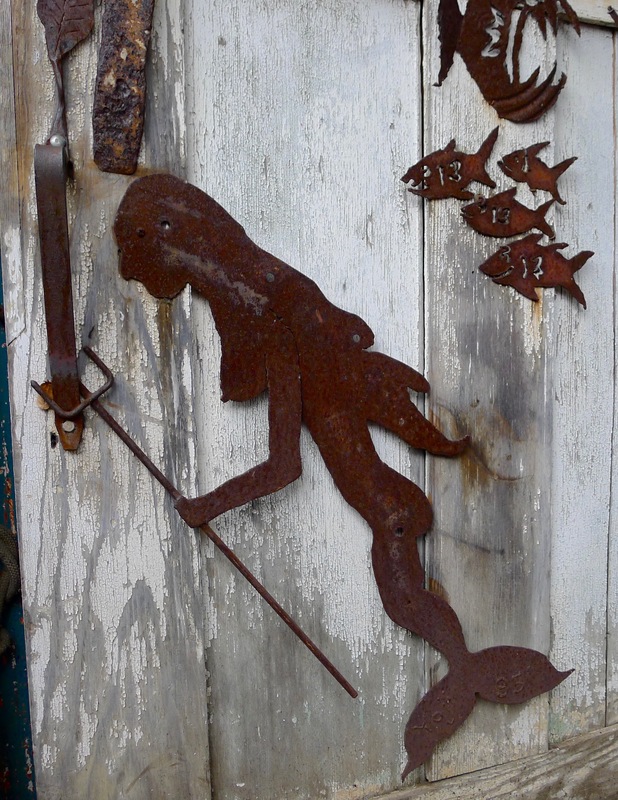 Her fix – be a mermaid, human above the waist, fish below. 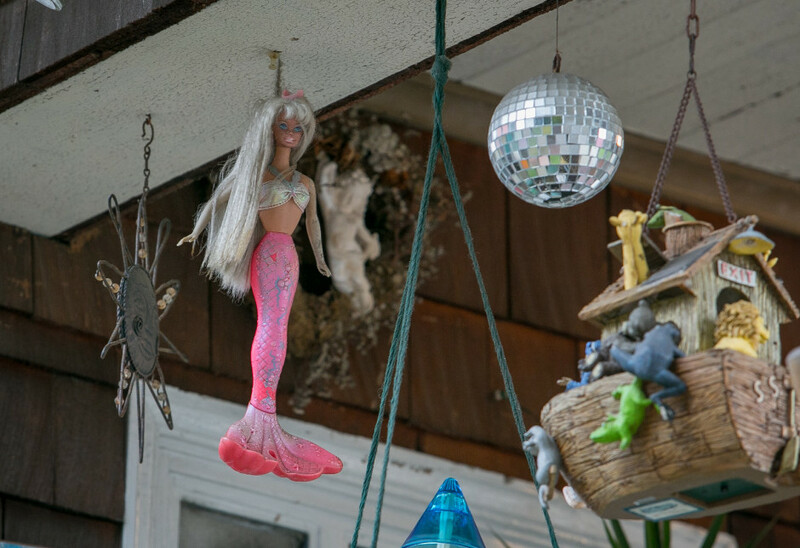 My friend Jesse, shown in the photo of the Coney Island Mermaid Parade below, tells me that the earliest depiction of a mermaid who is not a goddess is in the Norman Chapel, Durham Castle, built in about 1080. Who knew? 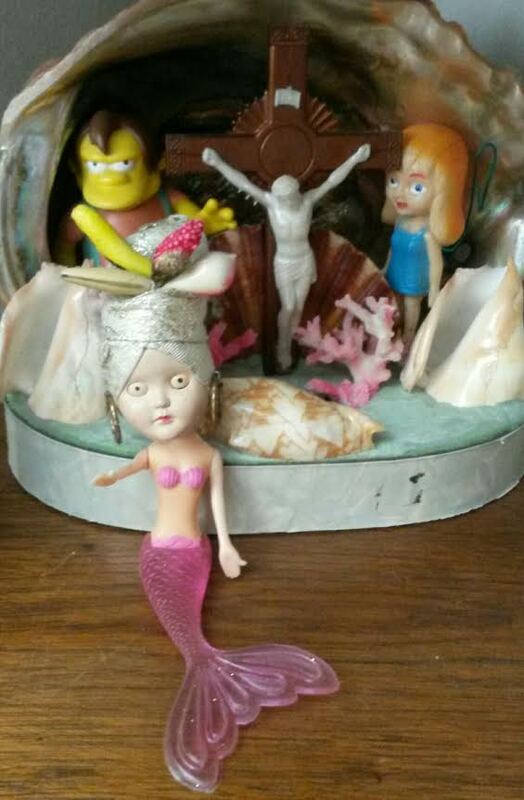 Since then, we have entertained romantic notions of aquatic humanoids, mermaids and to a lesser extent mermen. 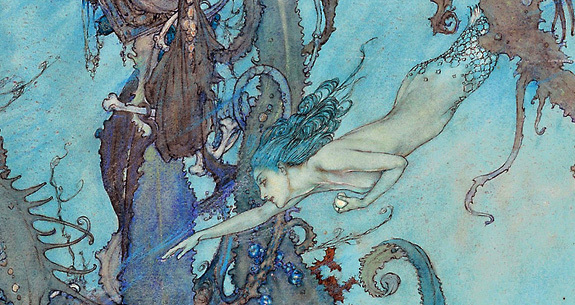 Through the ages – Hans Christian Anderson, John William Waterhouse, and Disney. 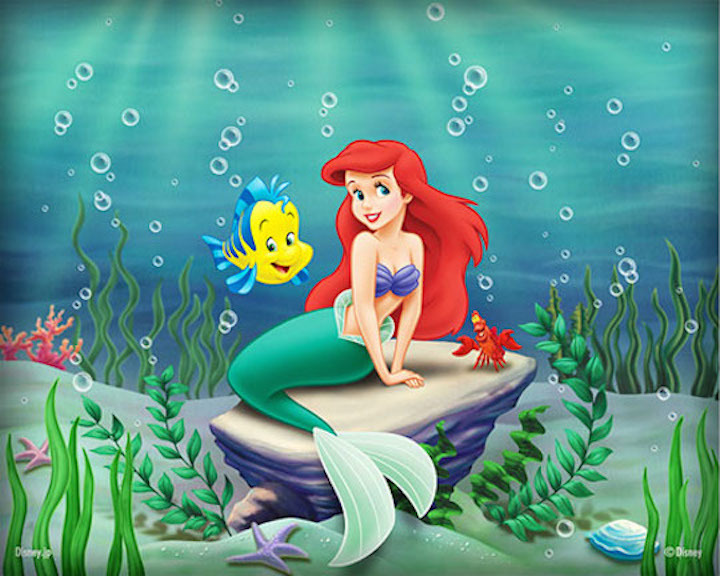 My oldest daughter Julia was four when the Disney “Little Mermaid” was released. We went to see it at the Oaks on Solano. It didn’t end well. 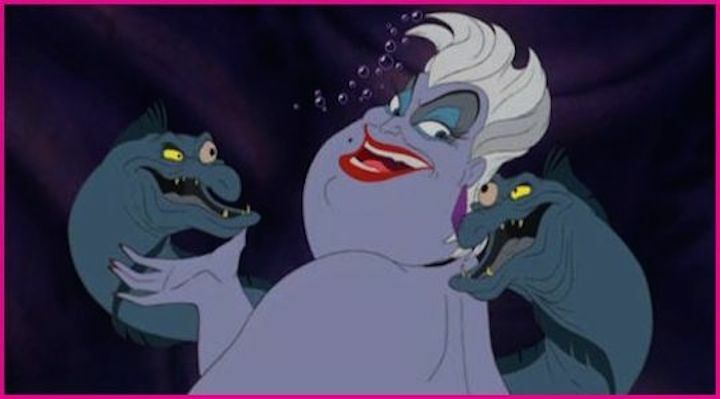 Ursala the Sea Witch terrified her. “This movie isn’t for kids!” is exactly what she shouted. She felt betrayed. I felt like the world’s worst father. 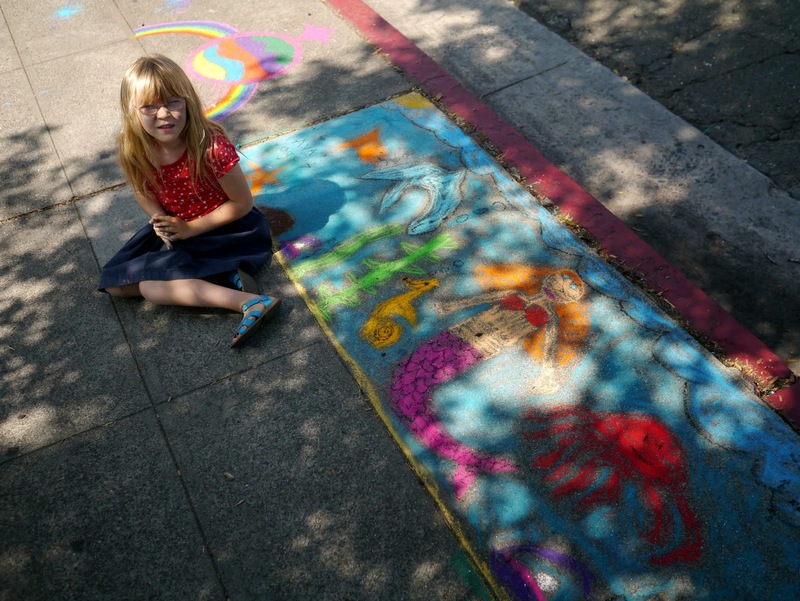 Now – the mermaids of Berkeley. 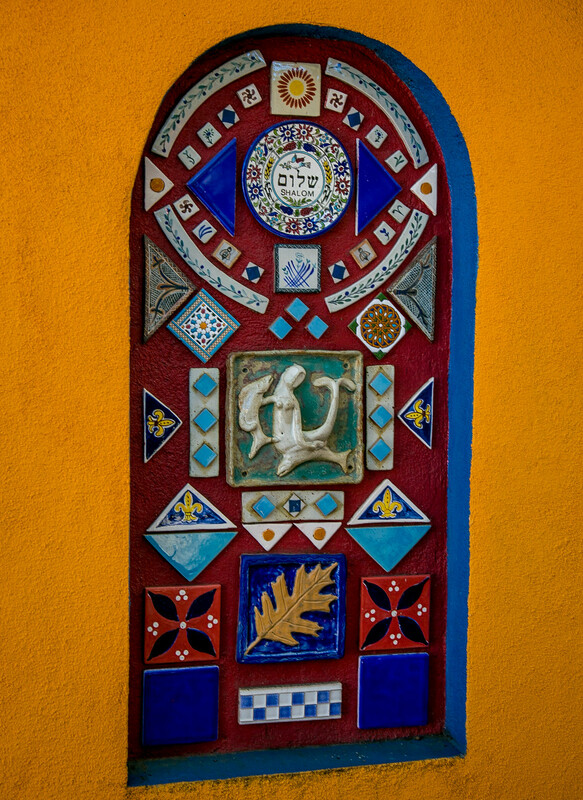 As icing on the cake, a few more that don’t fit the Quirky Berkeley parameters but are or were here in Berkeley. 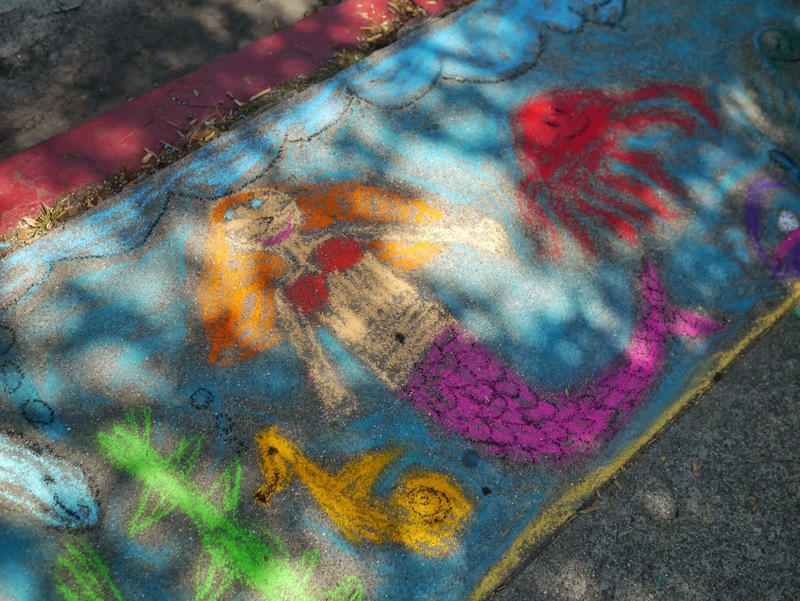 In the 2014 Chocolate and Chalk Festival, a girl named Ava made this mermaid. Long-gone, but brilliant when here. 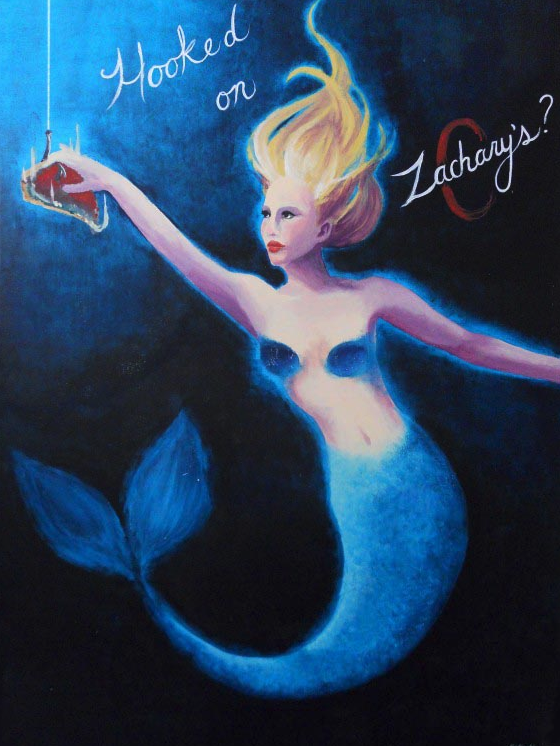 This was a 2011 entry by Katia Novak in Zachary’s Pizza art contest. 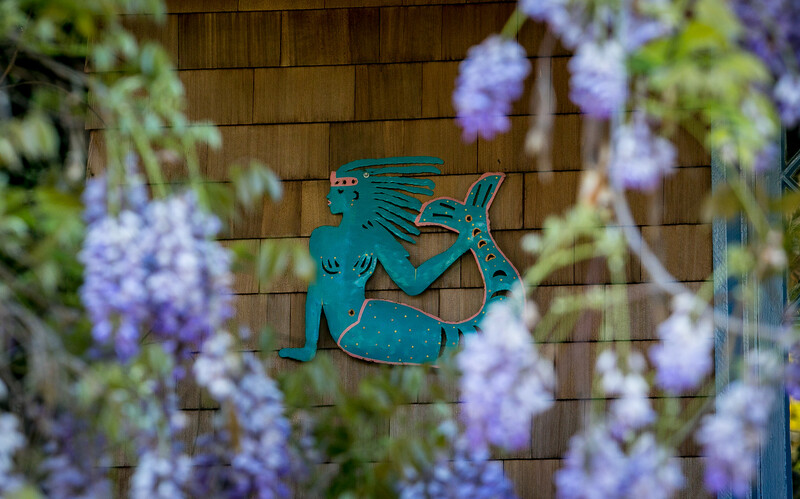 Hayley Ferreira is a Berkeley muralist who made this mermaid mural in a private home. Sweet! 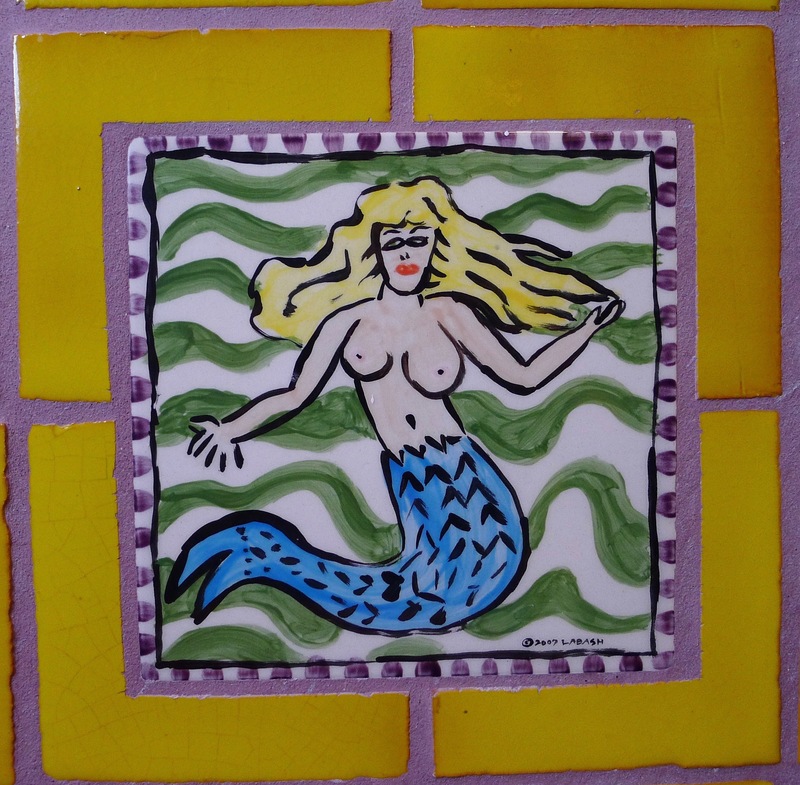 Joan Brown’s Mermaid (1970) is in the collection of the University. 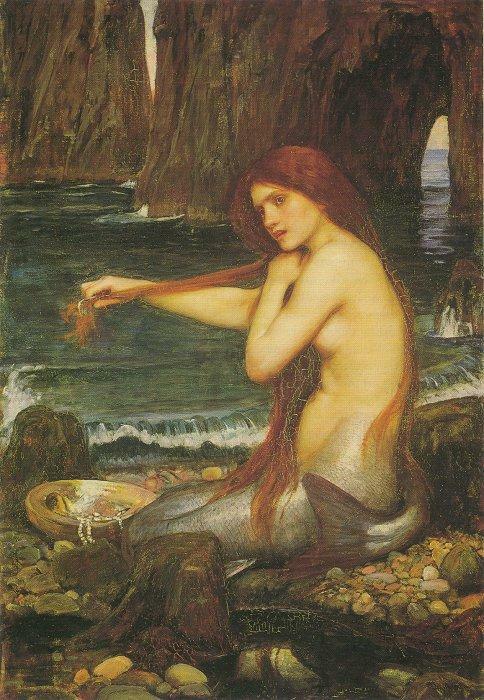 Of this painting, it it said: “Brown’s consistent exploration of the water theme—whether she called upon it in the production of veiled self-portraits, such as in The Mermaid, or simply to recall the meditative qualities of her daily swims—reveal the profound transformations and explorations that took place throughout her career, and a commitment to her practice despite the tumultuous nature of the art market. 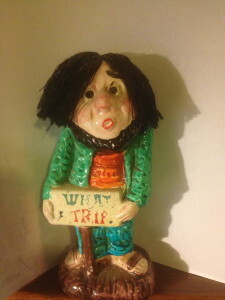 It was this rigorous process of introspection that led to self-awareness and ultimately, self-definition.” Lots of words! 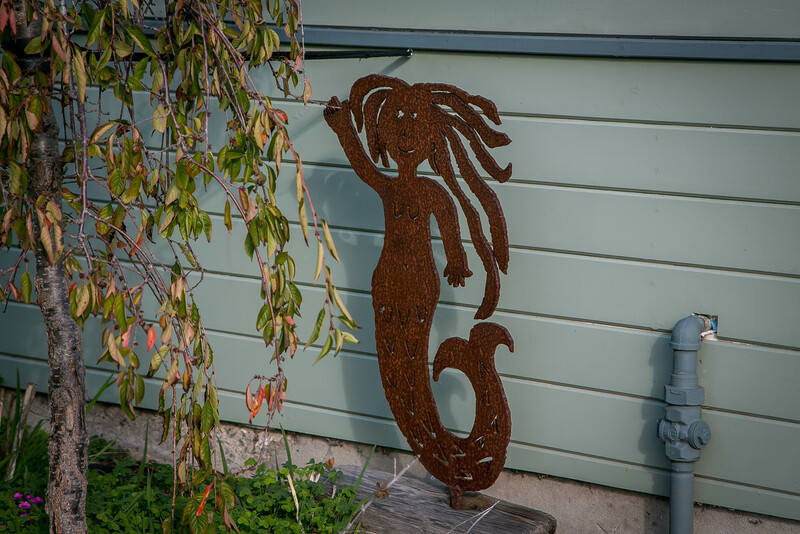 A splendid mermaid. 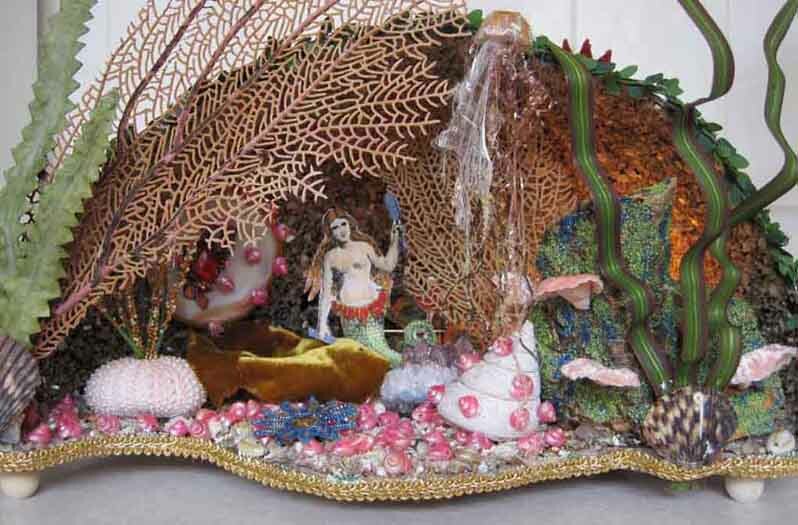 These two mermaid grottos were made in classes at our Castles in the Air on Fourth Street. 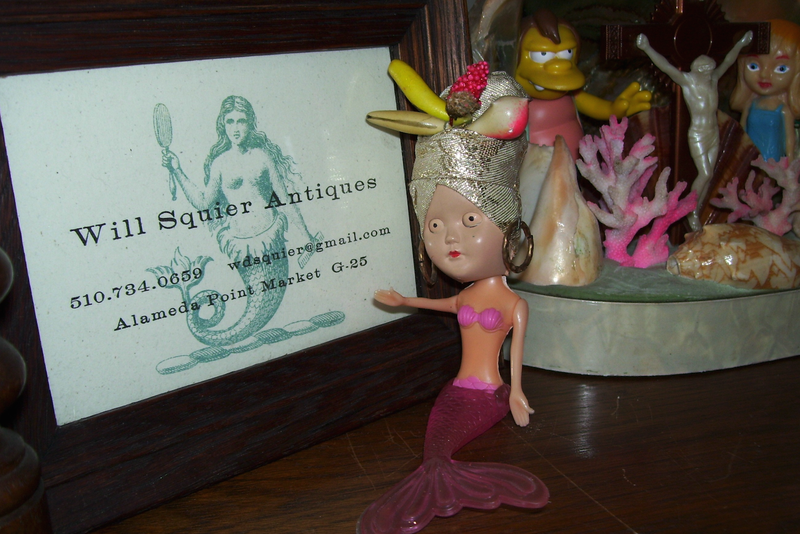 Small world department – I have posted about Will Squier and his sufficiently strange kitsch. 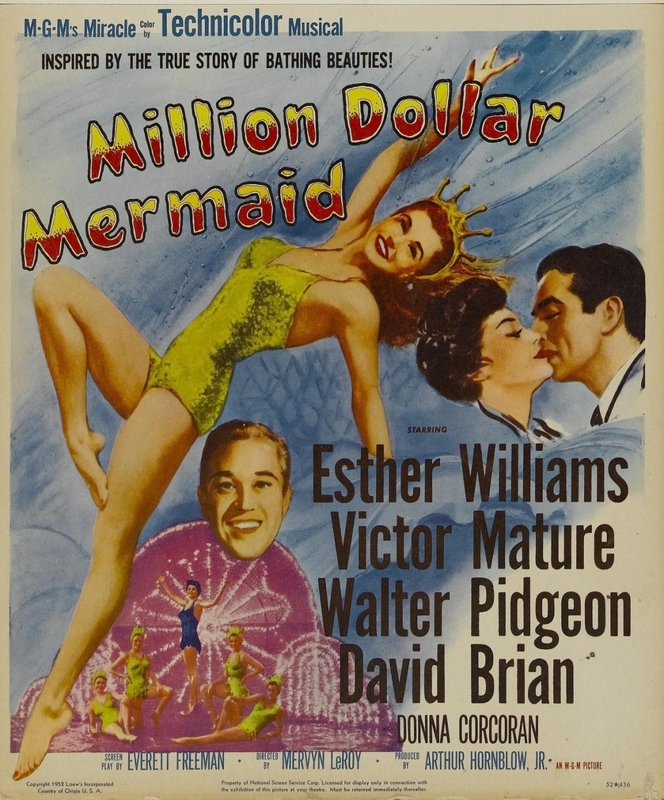 The 1952 movie. Choreographed by Busby Berkeley. I am not proud of this, but years of Googling “Berkeley + X” and getting Busby Berkeley images finally got to me. Busby, you win. 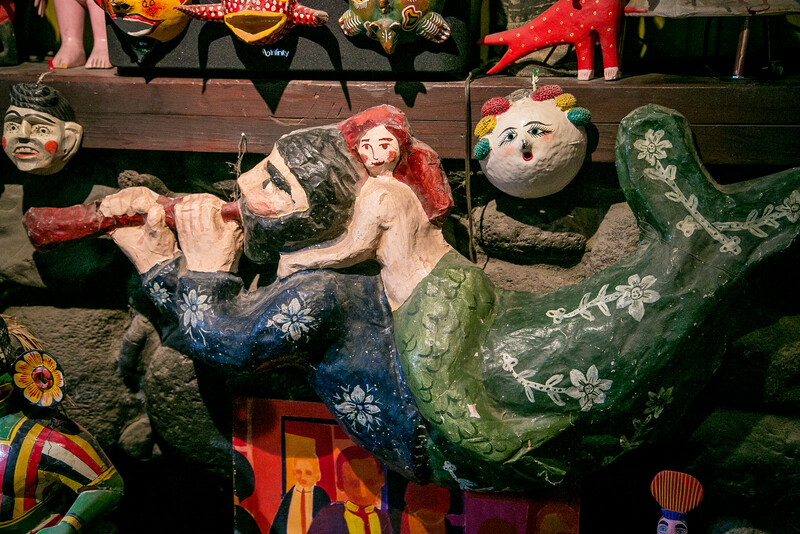 Finally – I think – a couple from our neighbors. Ruth Asawa‘s sculpture at Ghiardelli Square. 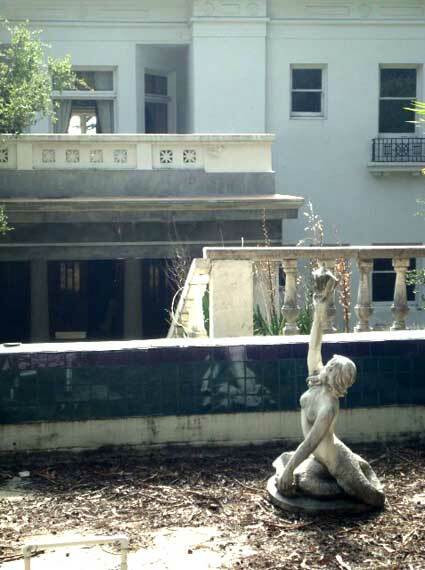 Asawa – a woman for the ages. 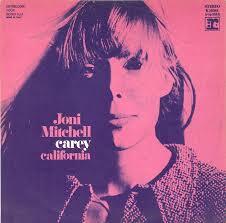 I met her several times when I was in my teens and twenties, unaware of her greatness. I am close to the Lee and Woodbridge families, who were in Ruth’s inner circle. All about me! She was a remarkable woman. 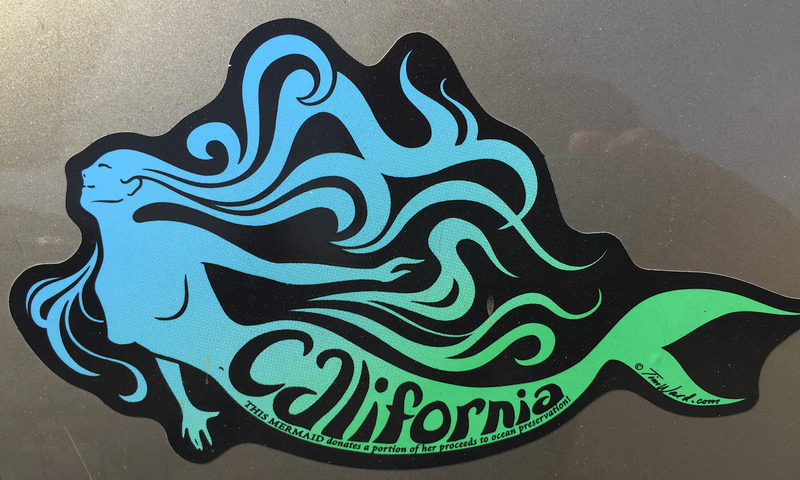 Mykael Moss sent me this photo of a mermaid bumpersticker seen in Berkeley. 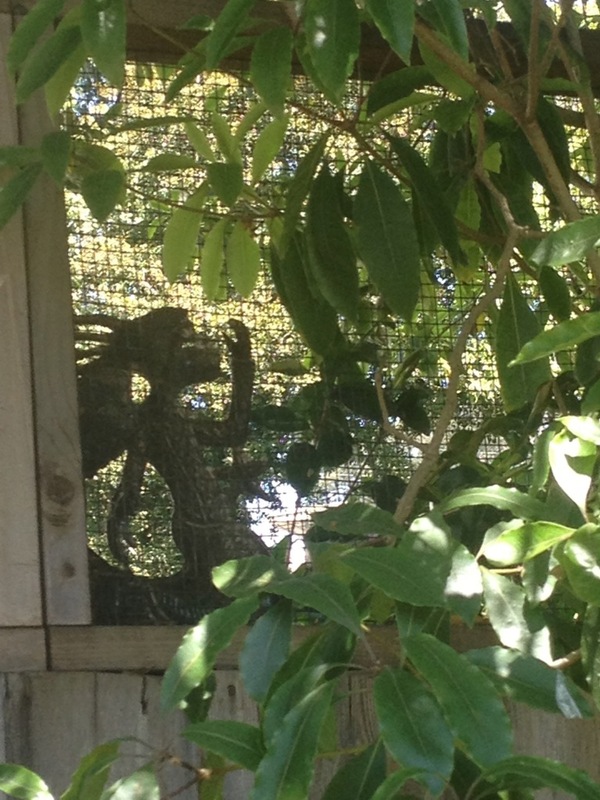 This is from Susan Alexander’s home in Glen Ellen. 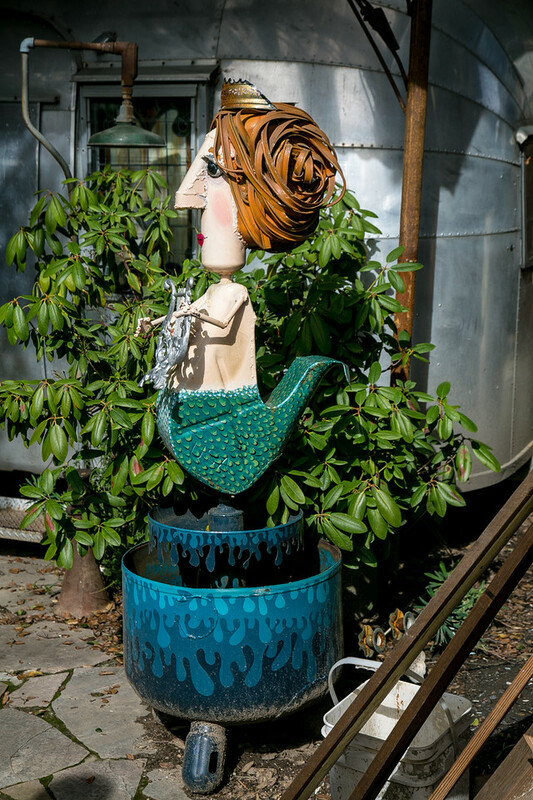 This is from the backyard of Patrick Amiot and Brigitte Laurent in Sebastopol. 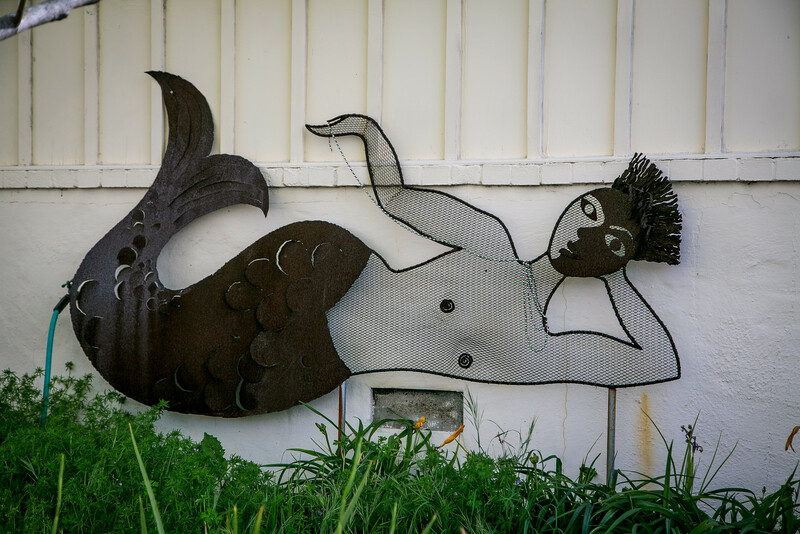 A second Amiot/Laurent mermaid, this one on a neighbor’s lawn on Florence Avenue, Sebastopol. 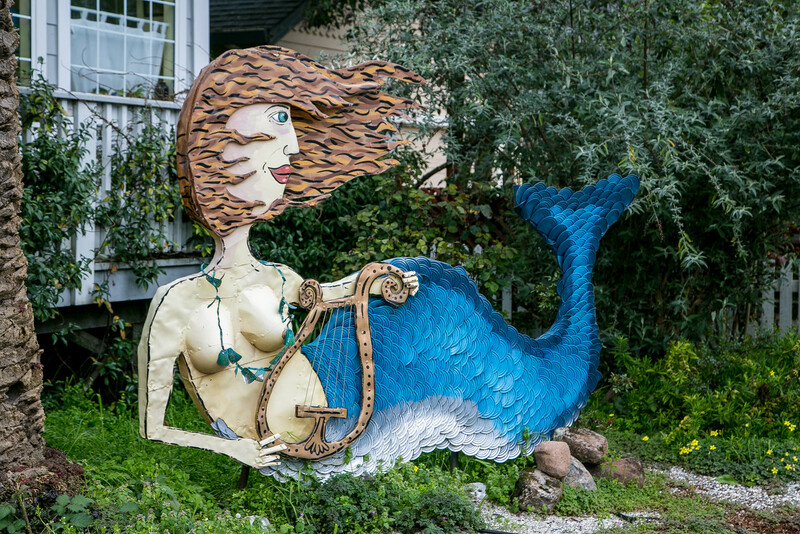 For more about mermaid sculptures of the world, see here. Okay – granted, we may not be Coney Island. 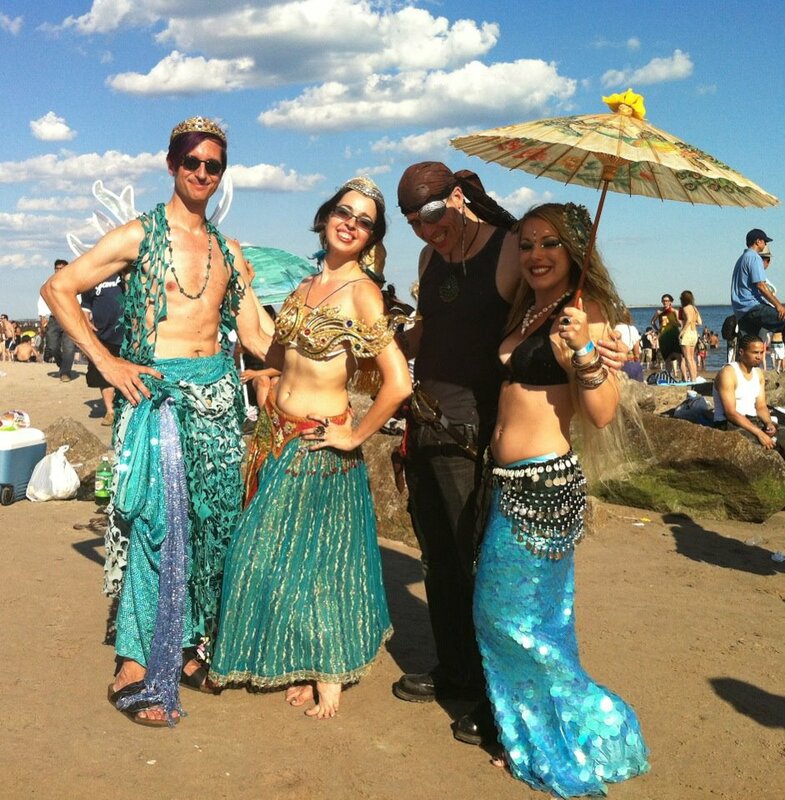 Coney Island has its beginning-of-summer Mermaid Parade. Good on them. We aren’t them, got it. I accept it. 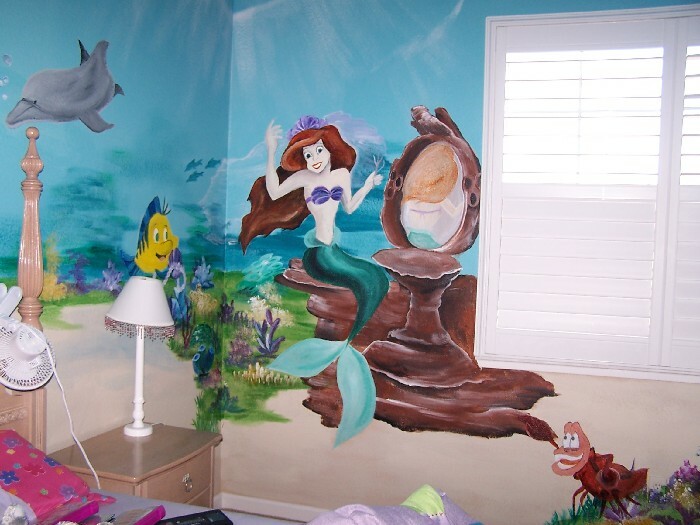 But we have nothing to be ashamed of when it comes to mermaids. I showed the photos to my friend. 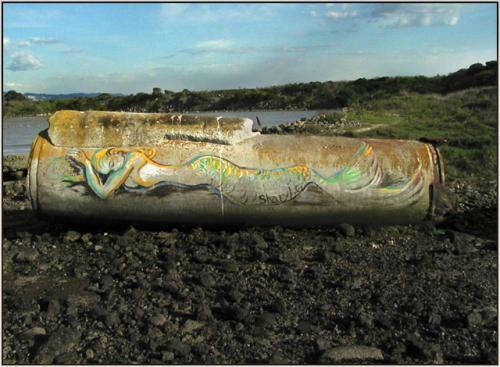 He was charmed by the photos, but got hung up on the term “aquatic humanoid.” He is a huge fan of the 1984 movie “C.H.U.D” -cannibalistic humanoid underground dweller. “Aquatic humanoid” is the type of definition that he (1) finds amusing but (2) can’t stop thinking about. 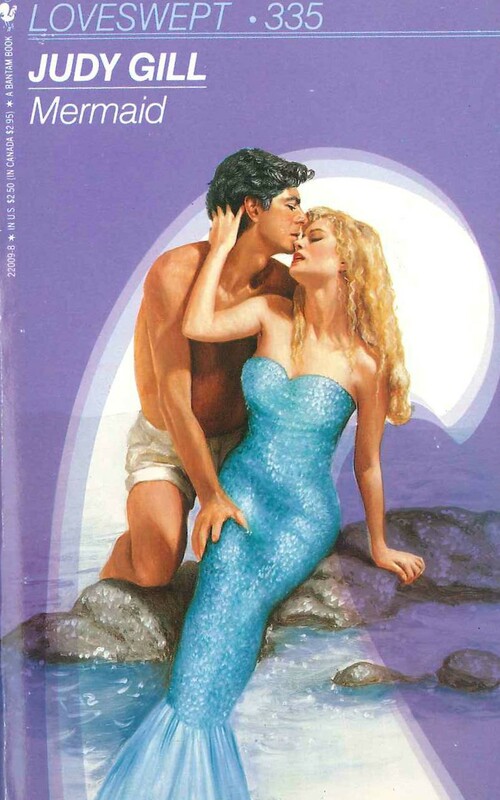 To draw him from the loop of the term, I tossed him a mermaid romance novel. He opened the book randomly and read a short passage: “Her flesh was as soft as velvet, its wet warmth smelled like the water around them, as if her pores had soaked it up. ‘Mmmm, you smell like nature. '” No doubt but that he would read it all tonight. Tom , you’ve really been working the quirky beat, Well done !!! 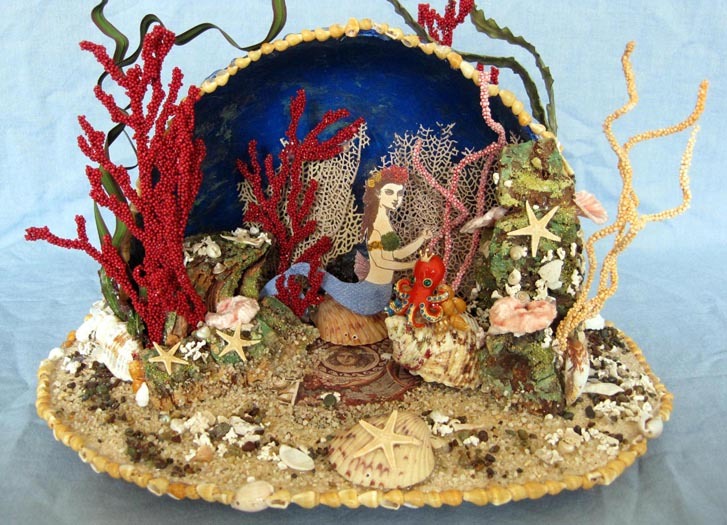 I never met a mermaid I didn’t like, and I love the ones you found here. Btw, I have 3 of my own.